We have this print sitting on our mantle. It's one of my favorites from Katie Daisy. Reminds me sometimes in the midst of it all to just stop for a little bit and take it in. I've told this before, but when I was a little girl, I used to close my eyes and say "I'm glad it's right now, I'm glad it's right now." Usually it was in moments where I was just so excited for what was coming. or just happy in the very moment I was in that I wanted to breath in every bit of it. Shut my eyes. Memorize. Stop time. Back then it was things like getting McDonalds happy meals on the way to our grandparents house. One of my favorite things to do. Rain was falling on the windows of our van. We lived in Hawaii then. I remember it clearly. But now....now it's things like the way Bella says "right now", how she'd sit and cut pieces of construction paper and glue them together for hours if I let her. Or how Mia sticks her thumb in her mouth and holds her bear by the ear when she's tired. How Asher likes to write notes to us and leave them in places for us to find. The misspellings from him sounding out the words on his own. Those little misspellings are priceless. I want to remember them. I want them to stay clear. Bella snuggles up to me on the sofa. We watch our "morning show"---Rachel Ray. Mia is still sleeping. Thats our time. She wakes up asking if it's on yet. She says "moaning show" and it's pretty darn cute the way she does. Mia stands waiting and happy to see us as we go in to get her from her crib. Excited. She says "hi" to Bella. "Hi"... "Hi"....I can hear it clearly. I don't want to forget that. Asher comes home from school, shoes dirty, new holes in his pants. He is such a boy. He squeezes me tight and tells me he missed me. 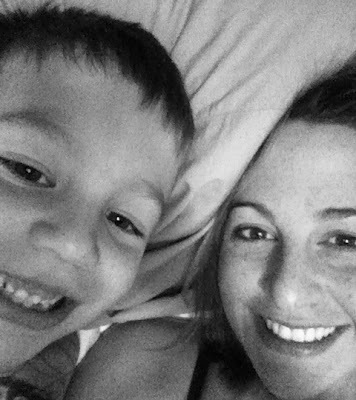 At night when I put him to bed, he asks me to cuddle. I pull him close but it's never close enough for him. He asks me to pray and sometimes he prays too. I don't want to forget that. The idea that memories can fade or that details get blurred. I hate that. I don't want them to. But I know it happens. life happens. time happens. And with it comes distance, further and further away from these moments. So the only thing to do is be present in them. Appreciate them here and now. Don't worry about them slipping away. Capture them however you can. Retell your stories, but mostly just live in them. (New follower from Hanna at Bouffe e bambini) Absolutely love & agree with your post! While my 1st little guy is only approaching the 6 month mark, I too don't want to forget anything. I want to cherish every moment he wants to cuddle. how simply delightful. I need to remember to be glad it's right now. Right now is just so sweet. a nice reminder and beautifully written. you are the sweetest person ever! love this post.